It's a Scrappy World: 3-31 New Release at Bugaboo Stamps! 3-31 New Release at Bugaboo Stamps! Hey all! I am so excited that spring is finally here in North Carolina! The warm sunshine coming through my scraproom window is more than welcome! It has definitely reignited my flickering mojo, and boy have I been creatin' up a storm! It is New Release Day over at Bugaboo Stamps and the design team has a bunch of fun and fabulous projects to share with y'all! Find all of the latest projects at Catch the Bug with Bugaboo Stamps for some inspiring ideas! Don't forget to head over to Bugaboo Stamps to snap up todays New Releases so you can have fun creatin' gorgeous little cards, and papercrafting projects too! 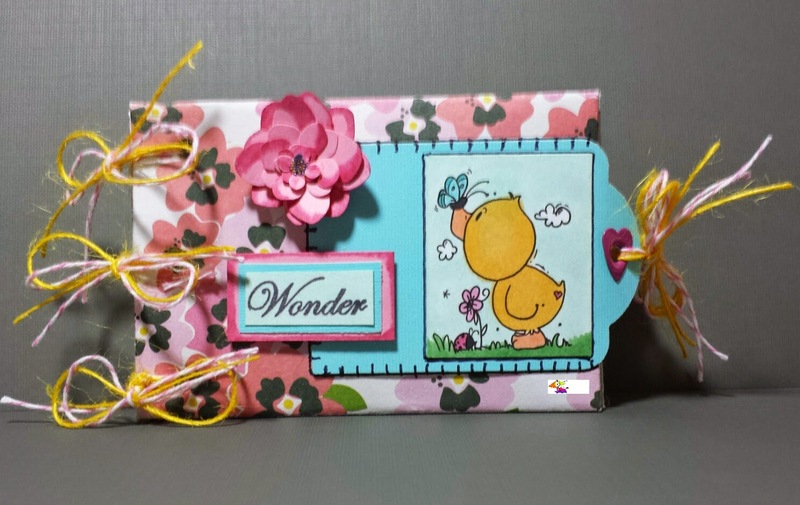 My project below is a mini scrapbook that I created using one of todays New Releases from Bugaboo Stamps - Spring Duck. It has several little pockets and pulls for journaling, and plenty of places for adding wallet sized pictures and memorabilia. Best of all, it uses mostly scraps and recycled materials! Stay tuned for the tutorial I am planning to make and add to my blog in the next few weeks! These little albums are so quick and fun, I just will have to share a 'how to' with y'all! This is such a darling image and album, can't wait for the tutorial on this! Such a cute image and beautiful card, thanks for sharing it with us over at Simply Papercraft. Adorable mini! Thanks for sharing with us here at 613 Avenue Create! Your project is darling! Thanks for playing along with us at 613 Avenue Create. It sure looks like a fun project - looking forward to your tutorial! Like the heart eyelet you used in the tag - Thanks for sharing your project & creativity with us at Aud Sentiments! What a cute album using such a sweet image! Thanks for sharing with us at Crafty Gals Corner! Such a cute car. TThanks for joining us over at Scrap&craft. Good luck. A lovely looking little album and a fabulous idea. The image is so sweet. Love the image so cute and the layout of the card, thanks for sharing it with us over at Simply Papercraft.